July soybeans have firmed on positive comments over the weekend from both sides of the US/China trade negotiations. Treasury Secretary Mnuchin said that the US and China are hopefully getting very close to the final round and said both parties may hold more in person trade talks in the near future. July soybeans are trading at 912 ¼, up 3 ½ cents at mid-day with July soybean meal up $2.60 at $314.20 and July soybean oil down .16 points at 29.12. US exporters announced the sale of 140,000 tonnes of soybeans to Unknown destinations this morning. The NOPA March crush came in at 170.0 million bushels versus the average estimate of 169.1 million bushels (164.8-171.4 million range) and compared to 154.5 million bushels in February and 171.9 million last year. Oil stocks came in at 1.761 billion pounds versus the average estimate of 1.783 billion (1.702-1.872 billion range) and compared to 1.752 billion in February and 1.946 billion last year. Soybean export inspections for the week ending April 11th came in at 460,667 tonnes. Cumulative inspections year-to-date are 30,648,830 tonnes which is 27.6% below last year’s 42,352,000 tonnes. 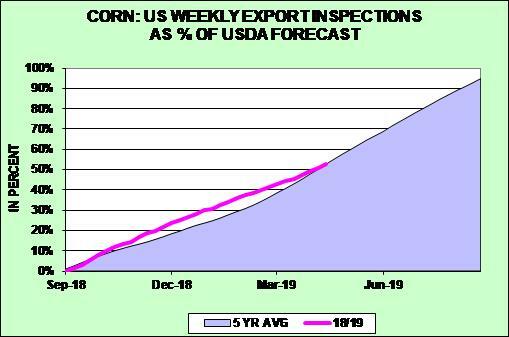 This is 60.1% of the USDA’s forecast for the 2018-19 marketing year versus the five year average of 83.2%. The top three destinations were China with 130,200 tonnes, Japan with 81,500 tonnes and Mexico with 75,600 tonnes. For the first quarter, China soybean imports reached 16.75 million tonnes, down 14% from last year. News that the China’s pig herd in March is down 18.8% might hurt demand short-term and it may be several years for the demand to return. Agrural estimates Brazil’s soybean harvest at 88% complete compared to 84% last week and left production unchanged at 114.6 million tonnes. The open interest in soybeans went down 4,214 contracts on Friday with soybean meal down 1,530 contracts and soybean oil up 508 contracts. July corn is holding gains so far today after trading up to a five session high at 373 early in the day. The market is trading at 371 up 1 ½ cents at mid-day. Traders remain optimistic on the US/China trade negotiations after comments over the weekend from Secretary Mnuchin. China may be considering a US request to shift some tariffs on key agricultural products to other products in order to sell an eventual trade deal as a win for farmers leading up to the 2020 elections. The shift is because the US does not intend to lift its own tariffs on 50 billion of Chinese imports even if an agreement is reached. Also, encouraging news came from the commerce ministry in China saying they would review whether to continue the anti-dumping and anti-subsidy measures on US DDG’s. Mnuchin also said the US would be open to facing repercussions if it doesn’t live up to its commitments of a potential trade deal. Corn export inspections for the week ending April 11th came in at the high end of estimates at 1,182,140 tonnes. Cumulative inspections year-to-date are 31,924,526 tonnes which is 13.7% above last year’s 28,085,200 tonnes. 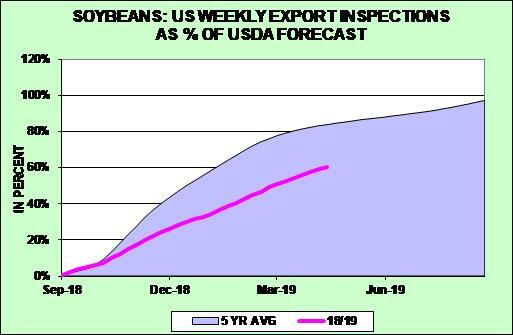 This is 52.9% of the USDA’s forecast for the 2018-19 marketing year versus the five year average of 50.1%. The top three destinations were Japan with 387,200 tonnes, Mexico with 285,500 tonnes and Columbia with 187,000 tonnes. Minor support is also seen from forecasts of heavy rains over the next five days with 1.5-2.5 inches for Northeast Iowa, southern Minnesota, Wisconsin and Michigan. There is also 3/4 to 1 1/2 inches for Iowa, Illinois and Indiana and heavy rains for the Delta. Traders are looking for corn plantings to come in near the five year average of 5% planted but progress will slow over the next 1-2 weeks. The open interest in corn went up 15,330 contracts on Friday. Wheat markets are struggling today with Chicago July down 4 ¾ cents at 459 ¾ and Kansas City July down 6 ¾ cents at 434 1/2. Minneapolis July wheat was higher early in the session but has turned lower at 535 ½ down ½ cent at mid-session. 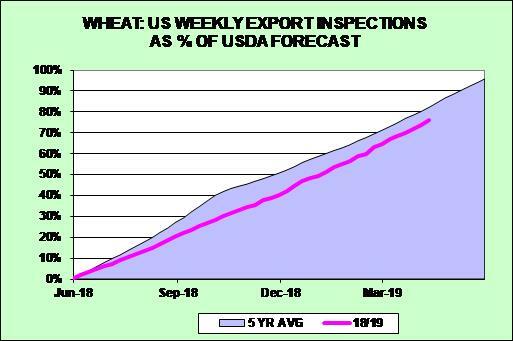 Today’s wheat export inspections for the week ending April 11th came in within expectations at 511,400 tonnes. Cumulative inspections year-to-date are 19,917,187 metric tonnes which is 4.5% below last year’s 20,862,100 tonnes. This is 75.8% of the USDA’s forecast for the 2018-19 marketing year versus the five year average of 82.3%. The top three destinations were the Philippines with 152,900 tonnes, Nigeria with 80,200 tonnes and Mexico with 70,100 tonnes. Bearish overtones are coming from Sovecon Agriculture Consultancy estimate for Russia’s 2019 wheat crop at 83.4 million tonnes versus 71.7 million tonnes this year previously. “Normal” India monsoon forecasts may have added to the bearish tone this morning with annual rainfall during the June-September rainy season expected to be 96% of the long term average according to the India Meteorological Department. French wheat conditions report showed 83% of the crop in good/excellent condition as compared with 84% last week. Spring wheat planting progress should continue to struggle with the late-season winter storm and traders are expecting spring wheat plantings at 4% compared to 1% last week. Winter wheat conditions are expected at 60% good/excellent unchanged from last week. The open interest in Chicago wheat went down 3,159 contracts on Friday with Kansas City up 762 contracts.